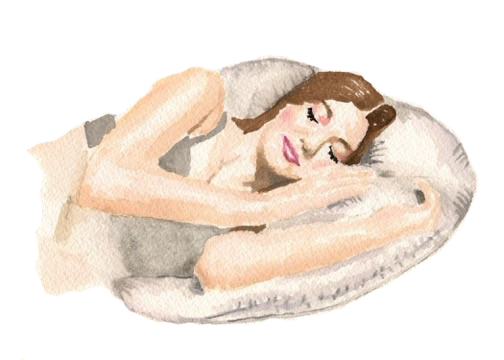 With Billow, sleeping after breast surgery is luxurious and soothing. to help you rest comfortably. We are so pleased to announce our partnership with Pink Lotus Elements, who will now be the exclusive distributor of the Billow pillow, Roll pillow and Heart pillows! The Pink Lotus Breast Center is a comprehensive, integrative & compassionate breast health center exclusively dedicated to the prevention, screening, diagnosis and treatment of breast cancer. I had the pleasure of being introduced to the Pink Lotus Breast Center on a trip to California, where I met with the wonderful staff and doctors at their facility. When they opened the Pink Lotus Elements shop, it was a natural fit for the Billow products. The Billow (breast+pillow) is a pillow specifically designed to provide relief and support to women with breast discomfort resulting from surgery (including mastectomy, reconstructive, augmentation or reduction), nursing and breast size. The Billow is designed to give your breasts and body a soft and supportive post surgery and provide comfort long after. We know what it’s like to have breast discomfort and designed the Billow for perfect breast, back, under arm and neck support while sleeping, relaxing or getting massage therapy. The Billow pillow is made in the USA of organic, chemical and cruelty-free materials, so you can feel good about how the Billow is made. Five percent of Billow’s profits are donated to breast cancer charities who allocate money towards research programs to help find a cure. may help to alleviate stress and pain. The Billow pillow keeps your torso raised and slightly elevated without compromising sensitive breasts and stomachs post surgery. This position is beneficial in providing relief proceeding facial or cardio thoracic procedures as well. The Billow roll pillow may be used to provide extra support behind the neck in this position. Billow pillow provides support to the neck and shoulder while lying on your side. Using the Billow roll pillow in this position provides extra comfort between the breasts or legs. The Billow pillow provides breast, under arm, neck and lower back support for those with extreme sensitivity in those areas. This position provides maximum comfort while lying on your stomach or getting a massage and is perfect for post surgery, nursing moms, or anyone who has larger breasts or needs extra back support while lying on their stomach. We have had some incredible feedback from attendees with all types of cancer and situations…We love Billow Global! Deep REM sleep again thanks to the Billow Pillow! I have been diagnosed with sleep apnea and have tried sleeping on my side, my cpap and a wedge. The Billow Pillow has been my answer! It is made of the softest material, keeps me cool, and lifts my upper body to just the right angle to keep me from obstructing my airway! Marnie, thank you for this miracle pillow!!! !